To read recent articles about religion and the Religious Right, click here. Many religious groups including conservative Christians oppose the Religious Right. To read a list of progressive church organizations that favor church-state separation, click here. 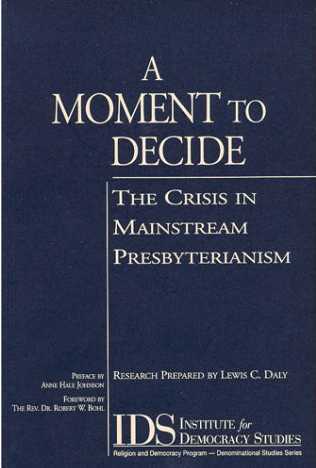 The battle for dominion has now moved to the Presbyterian, Methodist, and Episcopal churches. 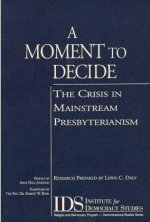 To shed light on tactics used to take control of mainline churches, the Institute for Democracy Studies has produced a report titled: A Moment to Decide. Howard Ahmanson: "The Episcopal Church split is the best evidence yet that Ahmanson's plan to bring America closer to resembling Calvin's elitist "church of the elect," or what Rushdoony has called a "spiritual aristocracy," is working." Charismatics share the basic doctrines of Pentecostalism but advocate working within affiliated churches rather than forming a separate denomination. The movement includes Roman Catholic churches as well as Protestant denominations. Some charismatic churches refer to themselves as "nondenominational." The Charismatic movement took shape in the 1960's. While Billy Graham strongly urged followers to get involved in politics, he did not advocate one political party which separates him from leaders of the religious right such as Jerry Falwell, Pat Robertson and James Dobson of Focus on the Family who targeted the Republican Party. In Approacning Hoofbeats: The Four Horsemen of the Apocalypse, published in 1984, Graham, unlike leaders of the religious right, called on Christians to work for peace. He supported an end to the nuclear arms race and environmental protection. The most shocking part of the impeachment proceedings was that all but five Republicans in the House of Representatives voted for the impeachment. What happened to the other moderate Republicans in the House? President Clinton's impeachment demonstrated the ability of the Religious Right to not only superimpose the Ten Commandments on constitutional law, but to also win the support of moderate Republicans in the process. The New York Times reported, July 17, 2004, that former U.S. Representative Tom Coburn Coburn, a practicing physician, "caused a political uproar this week by declaring in an interview that he favors the death penalty for "abortionists and other people who take life." Coburn is running in the Oklahoma primary for the U.S. Senate. The Times needn't be surprised. Dr. Coburn is speaking as a Christian Reconstructionist. Are We Becoming a Reconstructed Society? This opinion piece by Nicholas Kristof of the New York Times is called "God, Satan and the Media." Kristof doesn't distinguish between Evangelicals, fundamentalists, and Pentecostals, or Evangelicals and the Religious Right, but the article makes an important point.